My theme for this year has been "be intentional". I knew that one of the areas I really wanted to be intentional in was my daily time with the Lord. If you listened to Nancy Leigh DeMoss' session, you might remember her saying. I want my time with my Lord to be the priority of my day. And that is where my struggle lies. There is no substitute to getting into the Word alone, yet I often let other things take priority of my day. I have tried scheduling time during my day to spend in the Word, but it was never consistent. My schedule during the week was different every day. Some days I wouldn't be home during that time. And more often than not, I would get interrupted or distracted even if I was home. The phone would ring, someone would stop by, my house suddenly needed cleaning, and pretty soon nap time was over. I would get to the end of my day and realize that I hadn't made time for God. I might try to squeeze it in before bed, but I was so tired by that point that it was more to "check it off the list" than to actually listen and respond to God. "He wakens me morning by morning, wakens my ear to listen like one being taught." Does the Sovereign Lord wake you morning by morning? Wow. My answer was obviously no. She pointed out that even Jesus started His day this way. He knew He needed to. If Jesus needed to start His day with the Lord, how much more do I need to start my day this way? My strength for the day needs to come from my Sovereign Lord. He is in charge of my day. He knows what is going to happen in the hours ahead. So, of course I would want to start my day by going to Him. She challenged us to spend a little time with the Lord every morning even if it was just fifteen minutes...first thing. That is when I started setting my alarm every morning before Levi got up. Man that was hard. Especially on the mornings when little Levi decided to sleep in and I could have been sleeping right along with him. And yes, I failed. I failed again and again. I finally feel like this alone time in the morning with the Lord is becoming a consistent part of my day. And I LOVE this time in the mornings. It is the first thing I do. Before turning on my computer, before checking e-mail, before checking on my favorite blogs, before starting a load of laundry, and before I do anything else. I spend time reading the Word and in prayer...for my own heart, for Joel and his day, for Levi and our day ahead, for the sweet little boy growing inside me, and for the many things the Lord brings to my mind. I try to put my agenda at His feet and seek what His agenda for my day might look like. By the time Levi wakes up...which obviously is not exactly the same every day...I feel like my heart is ready for the day. This time in the morning has totally changed how I approach each day. Now, I am a total perfectionist and rule follower. I get frustrated when someone challenges me to do something a certain way and I fail. I just want to give up all together. Don't do that! I'm not telling you your time with the Lord has to look a certain way. This time with the Lord will probably look very different for each one of us. But like Nancy Leigh DeMoss said, I am challenging you to schedule this time early in your day. And if you can...try starting your day off alone with the Lord, when your heart is quiet. I think you will be amazed by how it changes your day. I am so excited for the 38 of you who are joining me in this challenge. How awesome to be encouraging each other to grow closer to the Lord. I am going to be praying for your hearts and for mine...that by the end of these 30 days the Lord will have done a changing work in each one of our lives. What will your time alone with the Lord look like? Be prepared. When will you spend time with the Lord? Schedule it and set that alarm! Where will you meet with the Lord? Find a quiet place where you will be alone and the least distracted. Encourage someone to join you in this challenge and keep each other accountable! Nancy Leigh DeMoss said, "What you need for this season and the next is His presence, His wisdom, His guidance." May we find His presence, His wisdom, and His guidance for this season and the next as we seek Him over the next 30 days. I love showing you pictures of my sweet babies. 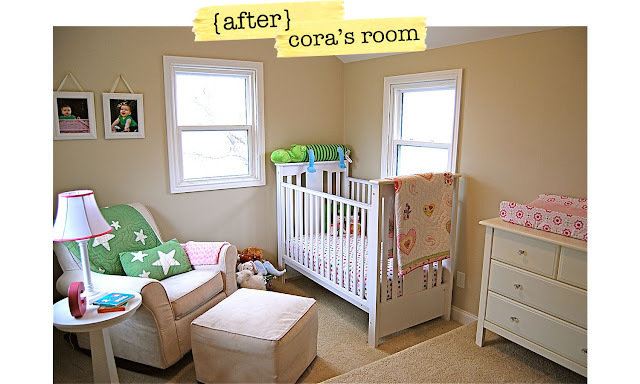 I love talking baby names and nursery ideas. I love decorating and showing you glimpses around my house. I love all the details of planning a party. I love crafting with my friends. And I love getting so many ideas from all of you talented and creative ladies. But there is something else that the Lord seems to keep bringing back to the forefront of my thoughts. Something that I constantly battle to keep a priority. Something that I am learning and growing in. and it is an area that we often tend to feel guilty about. But something that is far too important to keep to myself. It has to do with my daily devotional life. Not so much about whether I am checking my "devotions" off of my daily to-do list, but do I have "devotion" for my Lord? Am I daily cultivating an intimate love relationship with Him? I'm sure you would agree with me that we are all busy. No matter what stage of life you are in, whether you are married or not, whether you are working outside the home or working from the home, no matter how many kids you have, whether your kids are babies or grown...we are BUSY. And I feel like far too often as I've shared this long time struggle of setting aside meaningful time with the Lord and others have shared their similar struggles with me, we make excuses for each other. We sympathize in each others busyness. Especially as young moms. We remind each other that we have small kids at home and it is just about impossible to find time to squeeze in a shower or a meal, let alone time alone with the Lord. I leave those conversations feeling a little better about myself and a little less guilty. I leave continuing to run through the excuses in my head. And yet a few days later I find myself in the same place again. Knowing that I desperately NEED alone time with the Lord every day. I NEED Him to fill that hole in my life that only He can fill. I NEED His strength and wisdom to make it through each day. Losing Cora has opened my eyes to my desperate need to be connected to my Heavenly Father EVERY DAY. Death and grief challenged me to really get to know this God that I was putting all my hope in through my darkest hours. For me, those times of desperation, drove me to my knees. It wasn't hard for me to spend time with the Lord because I knew that His strength was the only thing that would get me out of bed and through those days without Cora. Now, more than two years later, God has done and continues to do an incredible healing work in my life. The grief and heartache are still there. I don't know if I will ever feel completely "normal" again, but my life looks much more "normal" than it did in those initial weeks and months after Cora's death. As my life returns to a little more of a "normal" stay-at-home mom routine, I find myself slipping back into the same struggles of giving the Lord priority of my time. A friend sent me a link to a breakout session from the True Woman conference. It is Nancy Leigh DeMoss speaking about our devotional lives. I loved it because I felt like it summarized so many of the things that the Lord has been teaching me over the past several months. If you have a chance today or in the next few days to listen, it is SO worth your time. In this session Nancy challenges the ladies to a 30-day challenge. So, as summer begins and my schedule changes, I am feeling like this is the perfect time to do my own 30-day challenge. If there are any of you that are needing a little accountability in your own personal devotional life I would love for you to join me. Wow. Thanks for all of the name suggestions. If I would have known how helpful you all would be, I would have asked sooner!! We have added some new names to our list. Who knows, maybe one of you will end up helping us name Baby Brother...we like to refer to him as "Eugene" around here (after my dear brother-in-law Loren Eugene). Keep the names coming! We ended up getting some rain and my farmer husband is oh-so happy. It will really help out his corn. The weather has been crazy though. Rain and tornado warnings one day, beautiful sunshine the next day, and today it is overcast and even a little cold. (Oh man, I am sounding like such a farm girl with all of this weather talk!!) Of course while we are thanking God for the much needed rain around here, we are devastated for the families who have had their lives turned upside down because of the storms. My heart aches as I think of the incredible losses so many are facing. You all are in our thoughts and prayers. The rain hasn't kept us inside. We pulled out Levi's rubber boots and he has wanted to wear them everyday since then. Water and mud are so fun when you are a little boy. Of course he always has time to stop for a snack. This child NEVER stops eating. And check out those finger nails. How is a mama supposed to keep a farm boy clean?? I think dirty finger nails might just be a part of being a boy in the summer at our house. Don't worry, I will still bathe him! Yesterday when it was so nice, we visited Joel at the farm. Levi even got to give the cows a snack. It is so fun to watch Levi becoming such a little boy. He is definitely not a baby anymore. I think there will be lots of fun summer memories ahead. Now if only the "summer" weather could stick around! 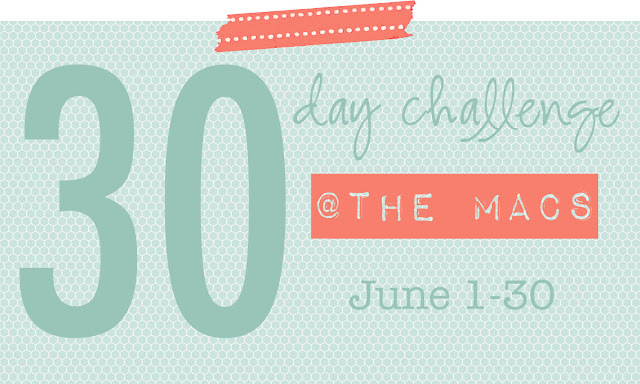 I have been planning a a little challenge for June and I would love for you to join me! I really struggled to get a good 20 week picture this time. Someone was really wanting to be in the picture too. The sibling jealousy has already begun...actually I don't think he has any idea what it means we talk to him about having a Baby Brother! And someone's daddy was being really goofy too. Those boys! *I am feeling really great...besides the awkwardness of a growing belly. I am hungry all the time, but that is nothing new for me. No major cravings...I just like to eat! *I am so thankful that we found out what we are having this time. It has been so good for me to stop thinking about baby girl things and focus on this sweet little boy that will be joining our family. I still miss Cora like crazy and long for a little girl around here, but once again the Lord has been so faithful to comfort my grieving heart. I love thinking about Levi having a little brother. I know they will have so much fun growing up together. *Baby boy names are hard. We have a small list of possibilities, but no decisions yet. I am open to any suggestions...are there any boy names that you love? I think that is about all the news. Time seems to be flying by and we are getting more and more excited to meet Levi's little brother! Yesterday the weather in Kansas was gorgeous. After being cooped up inside for several days last week because of the rain, we stayed outside as much as we could. We even ate dinner at our picnic table. So fun. I am loving this warmer weather. My hubby is hoping for some more rain this week...the crops really need it around here. It is hard for me to pray for rain when I would rather be playing outside with Levi in the sunshine...I guess we will just have to pray for rain and then play in it too!! Around here Levi got to help his cousin feed his bucket calf. So fun. Harrison is always so sweet and patient with Levi. Around here we decided it was time to put away the rest of the winter clothes. Levi had trouble parting with his owl hat. Around here Levi finally learned how to go down the stairs on his tummy. His mama has been a little paranoid about teaching him how to do this...he thinks he is awesome. Around here it finally rained...the farmers were very, very thankful!! It was cold too...maybe we shouldn't have put away the winter clothes so soon! Around here we played inside a lot because of the rainy weather. Levi loves riding his bike around our house. Around here Levi did his farming in his jammies. We had to find lots of things to keep us busy inside. Around here Levi thought he should wear his daddy's boots. He tried to walk, but he could hardly even pick up his foot. So funny. Around here Levi decided to not only ride his bike around the house, but also try out some new stunts. He is getting a little too brave all of a sudden. Around here Levi entertained himself by reading books...the entertainment lasted about five seconds. Can you tell we spent a lot of time in our jammies this week? Around here Uncle Owen came home from college and is working on the farm for the summer. Levi really likes his mini cooper...it is just his size. Around here we snuck outside every chance we could when the rain stopped. Riding your bike outside is much more fun. Around here we waited anxiously for daddy's big red truck to come home. It is the favorite part of Levi's day...he LOVES his daddy. Around here Levi helped me mop the floor. He is such a good little helper. Around here we spent Saturday evening at the park. Even daddy got to come. The sun was shining, the weather was beautiful, and it was the perfect way to end the week. 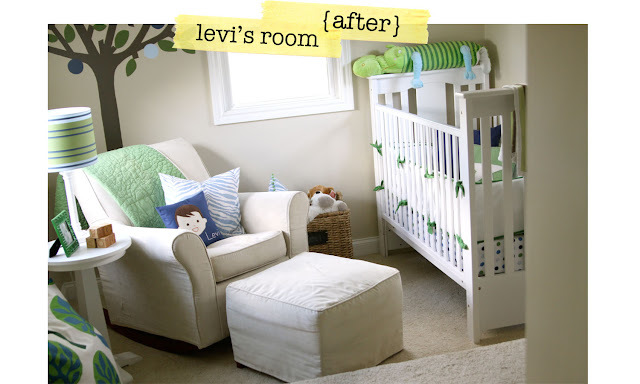 THANK YOU for all the sweet comments about Levi's room. I'm pretty sure I have the most encouraging readers ever! It was so fun for me to make Levi's room his own. It is quickly becoming one of Levi's favorite places to hang out and play during the day. We love it. Just for fun, I dug out the only "before" picture I had of Levi's room. This is how it looked when we moved in. Gotta love the light blue paneling and multi-colored striped carpet! It had to go though. I just couldn't work with it. Q: Where did you get the frame for the chicken wire thing. And what kind of paint did you use? A: The frame is from Hobby Lobby...it was originally black. I used Krylon spray paint (True Blue) from Walmart to paint it. Any frame would work of course. I tried to find a frame at a thrift store or antique store but never came across one big enough, so I just ended up buying this one from Hobby Lobby. Make sure you wait until the frames are 50% off though...it makes them much more reasonable! Ashley has a great tutorial if you want to make one. was that his birth announcement? A: The customized birth print was a gift from Megan. Thanks Megan!! She got it from My Sweet Prints. It wasn't Levi's birth announcement...just something fun for his room. Levi's birth announcements were from West Willow. There is one on the chicken wire frame too...or you can see it here. Q: Can you please do a tutorial on how you added the material to the roller shades? I wasn't sure exactly how this project was going to work. I asked the lady at JOANNS what kind of adhesive she would recommend for adhering fabric to a roller shade and she suggested Fast Grab Tacky Spray. So that is what I tried. Basically...I cut my fabric to the size of the shade plus a little extra so that I could fold it over at the bottom. I followed the directions on the spray can and sprayed the adhesive onto the roller shade (the shade was all unrolled and spread across a table). I laid my cut fabric on the adhesive and used my fabric ruler/cutter to smooth all the bubbles and creases out. After it had dried, I trimmed the extra fabric off the edges if there was any. Then, I rolled it up and hung it in Levi's room. Pretty easy. The roller shades have been hanging in Levi's room for a few weeks now and I have noticed that there are creases and bubbles that are starting to show up when I pull the shades down. Bummer. Maybe I needed to use more adhesive than I did?? So, this might not be the best tutorial...but that is what I did. If anyone has used a different adhesive that worked for roller shades make sure to let us all know! 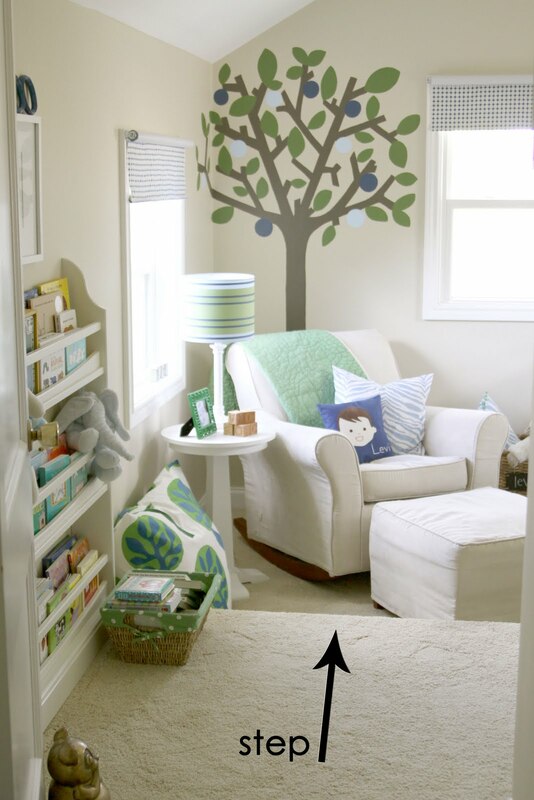 Q: Could you do a paint-the-tree-on-the-wall tutorial? The tree...I found a picture of a tree online that I liked the basic outline of and printed it onto an overhead transparency. I borrowed an overhead projector to shine the image onto the wall. I started with the tree trunk and branches and painted it right onto the wall following the overhead projector lines. I painted one color at a time and waited until it had dried to start the next color. I used the little sample cans from Lowes...it was plenty of paint...I don't remember the colors though. and when I could paint in his room while he was sleeping and he wouldn't even wake up. That seems like so long ago! Q: Just wondering how you like the rocking chair. I love the one at pottery barn kids but don't want to spend that kind of money. This one looks perfect and the price is right. How much do you use it and is it comfortable? Q: Which slip cover if any you purchased from Walmart for your rocker and ottoman? A: I too loved the Pottery Barn chair but didn't want to spend the money. This rocking chair & ottoman from Walmart was so similar and much better priced. I read the reviews and decided to give it a shot. We have had it for a little over three years now and have been very pleased. I fed both of my babies in it every night until they were sleeping through the night. Joel and I have both sat in it every night to read the kids books before bed too. It is comfy and substantial...Joel even thinks so and that is saying a lot! The beige suede looking slip covers weren't my favorite, but the only neutral option. They are better than I expected...and I have washed and dried them several times (due to the spit-up babies) and they came out great! Q: Did you make the pillows with the zebra fabric? A: Yes, I made the zebra pillows. The fabric was from Hancock Fabrics...I think. Q: What is the paint color in the room? A: The paint color is Benjamin Moore's Carrington Beige. Love it. In fact I love it so much that after we painted Cora's nursery this color, I repainted my whole downstairs (kitchen, living room, dining room, bathroom and mudroom) the same color. It is a great neutral. Q: Will Levi be in a bed by the time the baby comes? Q: Did you get closet organizers for his closet and if so, where did you find them? A: We put the closet inserts in ourselves. The brand is Easy Track and we got them from our local lumber and hardware supply store. The shelves sit on metal pegs and are adjustable...so are the hanging rods. The green fabric bins are from Target. Q: Did you build his bookshelf onto the wall? That little mini chalkboard with the alphabet is so cute too! Is it an antique? A: No, the book rack is from Pottery Barn Kids. It is mounted to the wall so that kids can't pull it down. I found the mini chalkboard at a local antique store. Q: Where did you get all the letters? A: The "moo" letters are from Hobby Lobby. They were gold and I spray painted them navy blue and sanded them a little. The "L" on the dresser is from JOANNS. I used Mod Podge to cover it with graph paper. We found the "L" above Levi's crib on the side of the road. It had fallen off an abandoned building. How perfect that it happened to be an "L" that fell off??!! Q: Is Levi's room 2 different levels? It looks like when you first come in you step down? 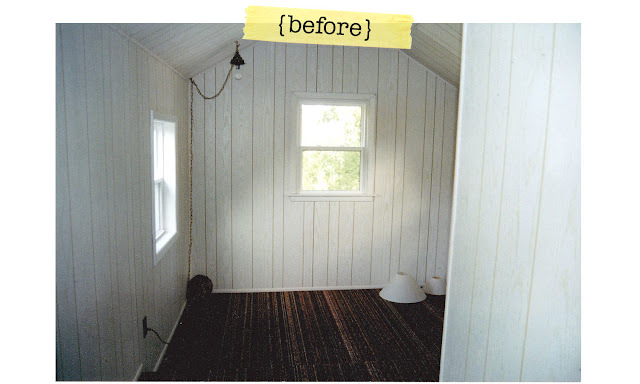 A: A downstairs bathroom addition was added onto our house before we moved in. The bathroom ceiling is lower than the rest of our house, so when this bedroom was added upstairs they put a step in where the bathroom starts. It definitely limits where you can put furniture. Levi likes it though...he often sits on the step when he is playing in his room. It makes the room unique! Q: Can you do a post that lists the blogs you frequent for sweet ideas? There are so many places to get great ideas...those are just a few I like. Q: Now can we see the rest of your house? Until then...here is a picture of me and sweet Cora in front of our little farm house. Hope that answers most of your questions!